The vision statement serves as the North Star for the Board of Pharmacy Specialties while we map out plans to create more intersections between board-certified pharmacists, advanced practice, and patients not only in our community, but in communities around the world. Over the last 6 years, BPS has experienced significant growth in terms of the number of recognized specialty areas—from 6 to 13—and the number of active board certifications issued from 15,862 to 41,609. The growth in the number of specialty areas and certifications is in response to the evolution of pharmacy from a product-centered practice to a patient-centered practice. Board certification is also tied to the growth in opportunities for pharmacist specialists and the need for practice advancement in the U.S. and around the globe. 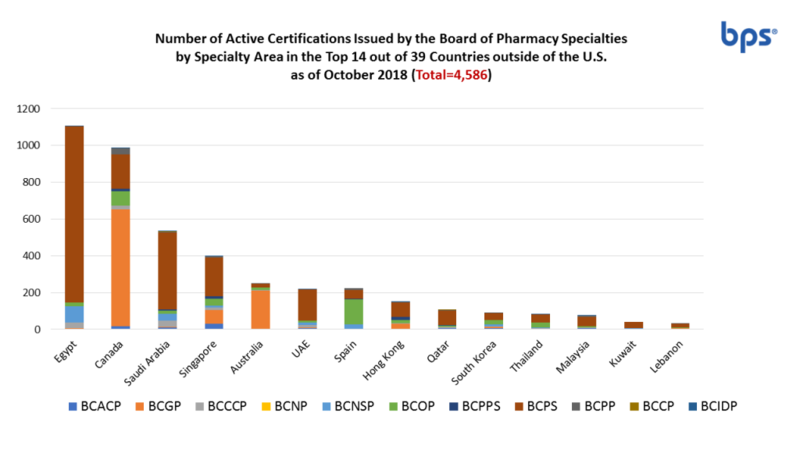 In the fall of 2015, there were 1,965 international active board certifications, and as of fall of 2018, there are 4,586, with at least one board-certified pharmacist in more than 30 countries. That is a remarkable milestone! Since 2015, BPS has facilitated ongoing dialogue with members of the International Advisory Committee and Task Force on topics related to trends and drivers for board certification. The overarching goal for outreach is to increase international access to board-certified pharmacists and to recognize the contributions of pharmacist specialists to patient care within local health care systems. Trends in the education and training of pharmacists are shifting to more optimally address complex medication-related challenges within patient-centered, interprofessional, health care delivery models. The US-Thai Consortium for the development of pharmacy education in Thailand is one example of a 25-year journey between schools of pharmacy in the U.S. and in Thailand to advance pharmacy practice by enhancing academic, research, and clinical programs. Pharmacy practice experience, residency training, and board certification are components of the credentialing and privileging framework that drive improvements to the health and welfare of all patients. Board certification is being positioned in the U.S. and around the globe as an international standard that validates the specialized knowledge and skills of pharmacists to assume advanced practice and specialization roles in a variety of settings, including community pharmacies, clinics, physician offices, hospitals, and even where patients live. Australian pharmacists have an opportunity to undertake medication management reviews by travelling to the homes of patients or to aged care residences. Board-Certified Pharmacotherapy Specialists and Board-Certified Geriatric Pharmacists meet the competency assessment requirements for pharmacists seeking Society of Hospital Pharmacists of Australia (SHPA) accreditation for medication management reviews. The SHPA accreditation is one of two routes to provide medication management reviews for remuneration under the 6th Community Pharmacy Agreement (6CPA). BPS board certification aligns with and contributes to the FIP 2016 Pharmaceutical Workforce Development Goals on Advanced and Specialist Expert Development related to: a) ensuring the competency and capability of an advanced expert pharmacist in all sectors for greater optimization of complex pharmaceutical patient care and b) the systematic use of professional recognition programs / systems as markers for advancement and specialization across the workforce. These instances provide a small sample of the progress towards advanced practice and specialization. BPS will continue to seek opportunities to expand the number of board-certified pharmacists and engage with the emerging area of advanced pharmacy practice by cultivating relationships, understanding requirements to enter practice (i.e., education, licensure, and registration), and determining the needs of examination candidates and certificants. Reaching 4,586 active board certifications with at least one board-certified pharmacist in more than 30 countries in 2018 is an important milestone from which we can chart future engagement and development activities.